AGV (automated guided vehicle), automatic guided vehicle system Aichi Machine Techno System Co., Ltd.
Aichikikai Techno System Co., Ltd has long developed in-plant conveyance technology as a group company of Aichi Machine Industry Co., Ltd.
We offer AGV technology to meet the needs of production lines. 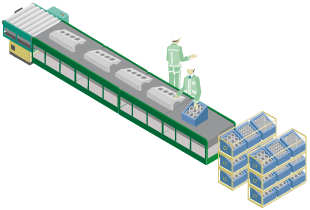 AGV system long-cultivated in the automobile industry has been used in a wide variety of production lines. We offer more flexible and eco-clean rationalization. Aichikikai Techno System attended Manufacturing INDONESIA 2013 and ended with the great success. 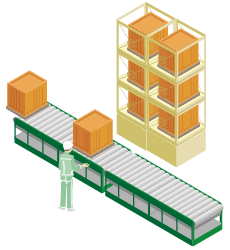 Dolly type has Towing type and Loading type. Please select one to match your purpose or environment. 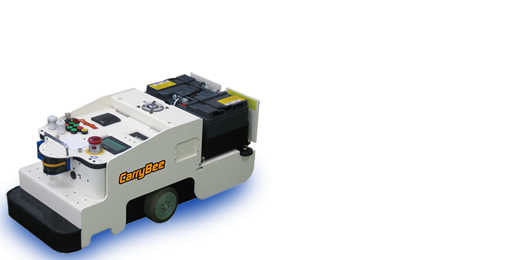 We manufacture the perfect AGV to fit customers' demands such as loading a drive roller chain conveyor to transfer workpieces automatically. 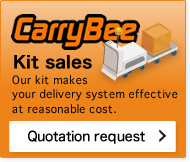 We offer CarryBee basic unit that makes your dolly and vehicle become AGV by incorporating the unit into them.